Sivaganga Park is a beautiful a recreational park and an ideal chill-out spot for visitors of all age. Regardless of the whether condition and season, the park offers a lot of fun to keep one active and amused. This park is actually not just a garden but it consist varieties of recreational activities such as terrestrial games and aquatic games. Besides, the park has a decent collection beautiful flower plants and some birds and animals. The park lately has emerged as one of the major attraction of Thanjavur for students, youth and tourists. There is a square tank in the Siva Ganga Park; this was believed to be built by Raja Raja Chola and renovated in the 16th century by the Nayak ruler, Sevappa Nayaka to provide water to the Tanjore Palace. Even today it is in use and is appreciated for its sweet-tasting water. 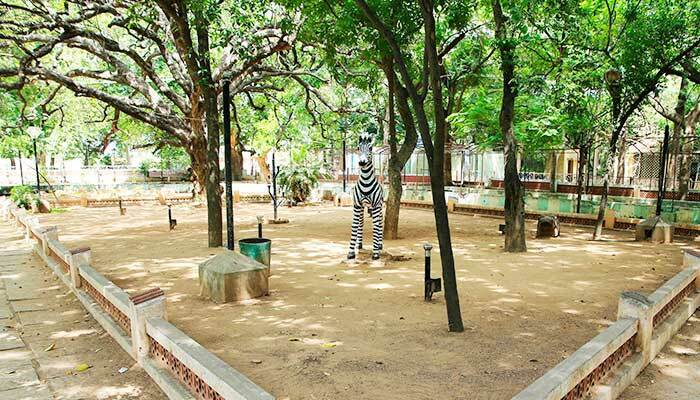 The Sivaganga Park was created as a people's park by the Tanjore municipality in 1871 – 72. It is situated to the east of the 11th century Brihadeeswarar Temple and encompasses the Sivaganga Tank believed to have been built by the Medieval Chola king Raja Raja Chola. In the initial days, the park was not maintained as the locality was overcrowded and ill-ventilated. However, the park is fairly maintained now. As a part of the makeover operations in the lead up to the 1994 World Tamil Conference, motor boating facilities were introduced in the Sivaganga Tank. > One of the major attractions of the park is a cable car linking to a small island like temple which fills one with a lot of thrill while travelling. > Visitors to the park would not like to miss the mini zoo located within the premises of the park. 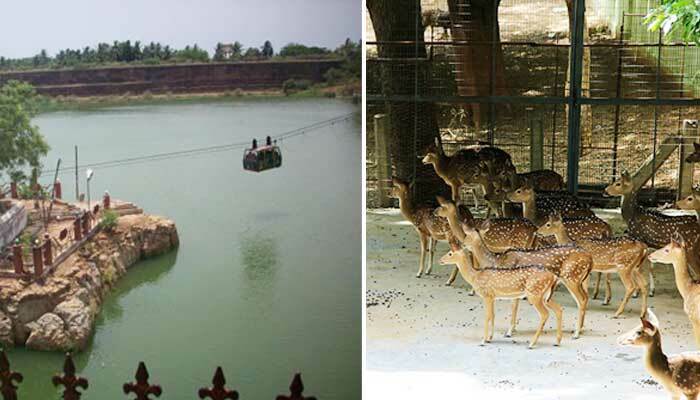 The mini zoo in the park encompasses a colorful birds like pigeons, ducks and animals such as jackal, rabbits deer etc. 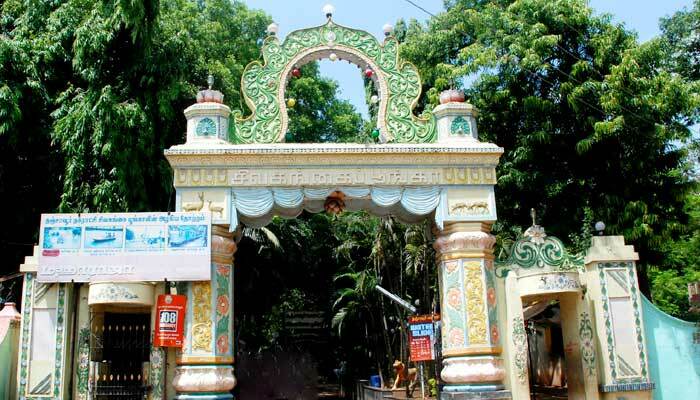 > The Sivaganga Park has a well managed science park, an interesting place for students and children to visit and enhance their knowledge base. > The Park has exquisitely laid garden with varieties of flowering plants. Visitors can enjoy the site of beautiful flowers or can relax for an hour. 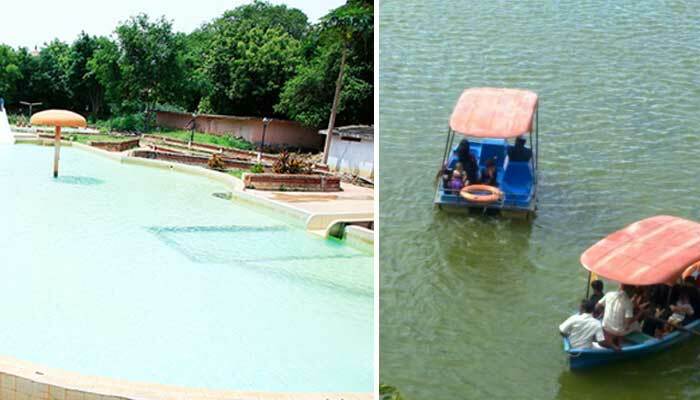 > Visitors can avail the motor boating facility available in the park and take a ride across the Sivaganga Park. > Visitors can enjoy swimming in the open pool and have fun with family and friends. In summer, swimming in the pool is something that every individual would love to do. 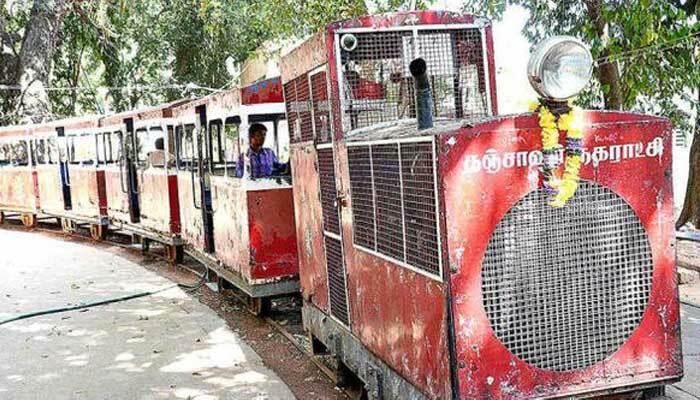 > A ride on toy train is specially an interesting activity to enjoy particularly for children. Kids feel unparalleled joy and delight after enjoying a ride on these trains. > The Park has a water sledge for fun loving people. It is great fun and refreshing too for the visitors to ride on water sledge. > Kids would love to wet in a giant rolling ball of Water tumbler. It truly delivers wild fun and fills kids with great excitement and thrill. Sivaganga Park is 1.2 Kms (5 Minutes) from Thanjavur old bus stand, 5.8 Kms (12 Minutes) from Thanjavur New bus stand, 56.9 Kms from Trichy.